Phase II of COMM Fire District’s fully integrated Emergency Response system has been completed. The district – located on Cape Cod, Massachusetts – can now boast one of the most advanced response capabilities in the country, with fully integrated dispatch from Symposium Technologies, record management from FIREHOUSE Software®, and GPS-based vehicle location from CompassCom. As a result, everyone in the district with a stake in public safety has something to smile about. Citizens who need the quickest and most effective response, firefighters and EMT’s who need access to the most up-to-date information, and politicians responsible for holding the line on costs can all be satisfied with a new tool that delivers improved capabilities at a reasonable cost. 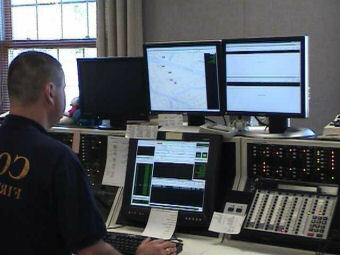 Now when an emergency is phoned in to the district’s state-of-the-art command center, the new system instantly pinpoints the caller’s location using sophisticated digital mapping, while simultaneously alerting the dispatcher to important information about the incident location stored in the system’s database. As the dispatcher talks to the caller and enters the details of the situation, the system instantly evaluates a host of complex factors that determine what trucks and personnel to send. It then makes a recommendation for the dispatcher to review and if necessary modify. In the trucks, the responding personnel have complete in-vehicle access to the same information as the dispatchers by means of mobile computers, which are linked via wireless network with the main system at the dispatch center, and with GPS receivers on the trucks themselves. Because the system tracks and time-stamps every aspect of who does what and when during an emergency call, the department can in turn produce a detailed record of each response, as well as longer term reports that will improve the quality of information available to the public, and help the district deliver better service.